Deoxyribonucleic acid, or DNA, is the name for the macromolecules in which all living creatures' genetic information are contained. Each DNA molecule consists of two polymers shaped in a double helix and attached by a combination of four specialized molecules called nucleotides, ordered uniquely to form combinations of genes. This unique order acts like a code that defines the genetic information for each cell. This aspect of DNA's structure therefore defines its primary function -- that of genetic definition -- but almost every other aspect of DNA's structure influences its functions. The four nucleotides that constitute DNA's genetic coding are adenine (abbreviated A), cytosine (C), guanine (G) and thymine (T). The A, C, G, and T nucleotides on one side of the DNA strand connect to their corresponding nucleotide partner on the other side. A's connect to T's and C's connects to G's by relatively strong intermolecular hydrogen bonds forming the base pairs that define genetic code. Because you only need one side of the DNA to maintain the coding, this pairing mechanism allows for the reformation of DNA molecules in the case of damage or in the process of replication. 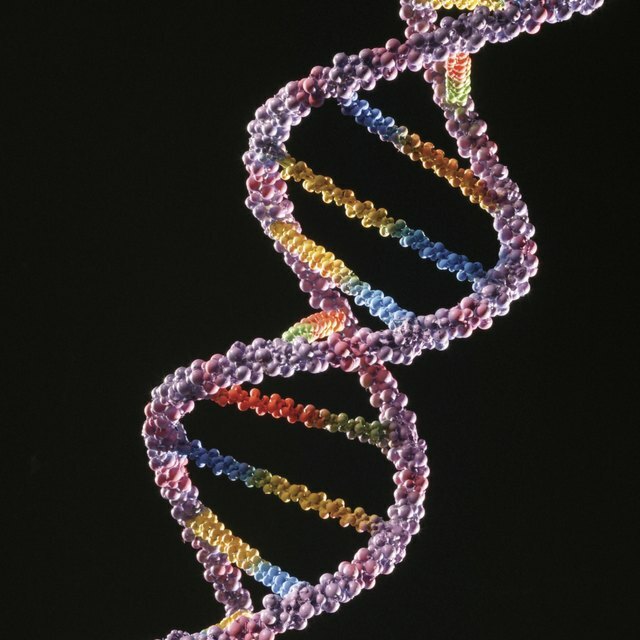 Most DNA macromolecules come in the shape of two parallel strands twisting around one another, called a "double helix." The "backbones" of the strands are chains of alternating sugar and phosphate molecules, but the geometry of this backbone varies. Three variations of this shape have been found in nature, of which B-DNA is the most typical in human beings.,It is a right-handed spiral, as is A-DNA, found in dehydrated DNA and replicating DNA samples. The difference between the two is that A-type has a tighter rotation and greater density of base pairs -- like a scrunched B-type structure. 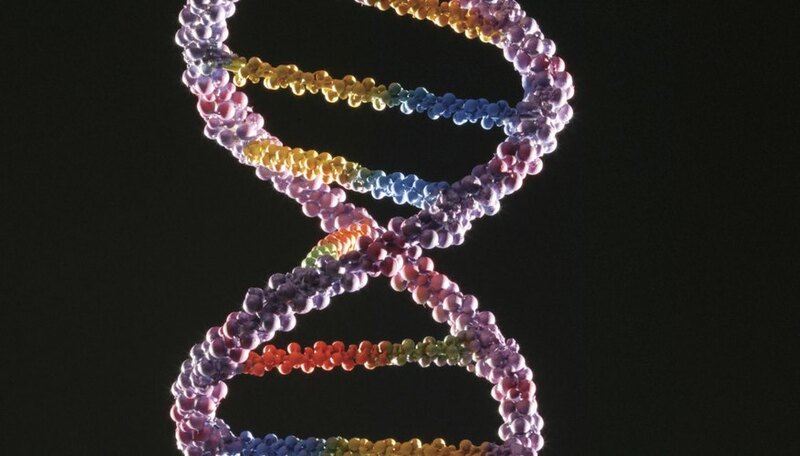 The other form of DNA found naturally in living things is Z-DNA. This DNA structure is most different from A or B-DNA in that it has a left-handed curve. Because it is only a temporary structure attached to one end of B-DNA, it is difficult to analyze, but most scientists believe it acts as a sort of counter-torsional balancing agent for B-DNA as it is scrunched down on the other end (into an A-shape) during the code transcription and replication process. Even more than the hydrogen bonds between nucleotides though, DNA stability is provided by "base-stacking" interactions between adjacent nucleotides. Because all but the connecting ends of the nucleotides are hydrophobic (meaning they avoid water), the bases align perpendicular to the plane of the DNA's backbone, minimizing the electrostatic effects of the molecules attached to or interacting with the outside of the strand (the "solvation shell") and thus providing stability. The different formations on the ends of nucleic acid molecules led scientists to assign the molecules a "direction." Nucleic acid molecules all end in a phosphate group attached to the fifth carbon of a deoxyribose sugar on one end, called the "five prime end" (5' end), and with a hydroxyl (OH) group at the other end, called the "three prime end" (3' end). Because nucleic acids can only be transcribed an synthesized from the 5' end, they are considered to have a direction going from the 5' end to the 3' end. Often times, at the 5' end will be a combination of thymine and adenine base-pairs all in a row, called a "TATA box." These are not inscribed as part of the genetic code, rather they are there to facilitate the splitting (or "melting") of the DNA strand. The hydrogen bonds between A and T nucleotides are weaker than those between the C and G nucleotides. Thus having a concentration of the weaker pairs at the beginning of the molecule allow sfor easier transcription. "Journal of Nucleic Acids Research"; Distributions of Z-DNA...;C. Champ, et al. ; 2004. David Charles studied history and Arabic in a liberal-arts college in New York and has been a writer for over five years. He has published pieces for newspapers at his alma mater and blogged about the Middle East. Charles, David. "How Does the Structure of DNA Influence Its Function?" Sciencing, https://sciencing.com/structure-dna-influence-its-function-8755272.html. 25 April 2017.